I cogitated this for a couple of weeks before making it drawing on a lot of ideas others have had over the years. The most similar pies at Village Inn to this one are the French Silk and European Truffle. 1. Remove the icky centers from the cookies and discard (or, you can keep them and not use the butter). Process the cookies until coarse powder. Separate off 1 cup, melt and mix the butter with the rest (if you discarded the cream centers). 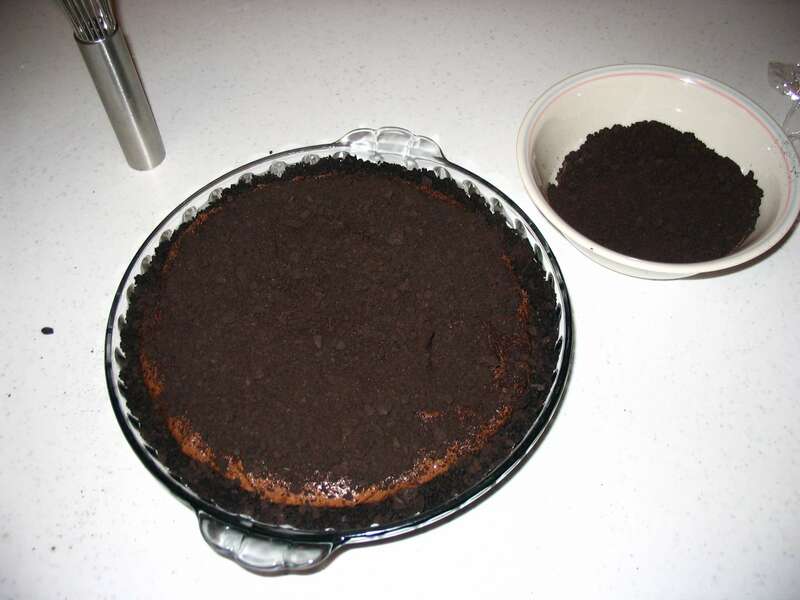 Press firmly into pie tin or plate taking care to mound adequately for the sides. If too crumbly, add more butter, but process finer next time (and add a little more butter). In my illustration, made the first time I made this dessert, you see I didn’t have enough butter in the crust. 2. Process the chocolate bar (Hershey’s Special Dark works fine) into a powder; place with ½ cup cream in a bowl int the microwave for 1 minute, stir, then return to microwave for another minute. Mix well. Pour this ganache into the crust taking care to cover the bottom and as far up the sides of the cookie crust as can be done without the sides crumbling. Refrigerate for an hour or so. 3. Make ½ my mousse au chocolat recipe. Halve all ingredients, but use 3 eggs instead of 2½. Pay especial attention to the eggs and to homogeneity of the various foams. 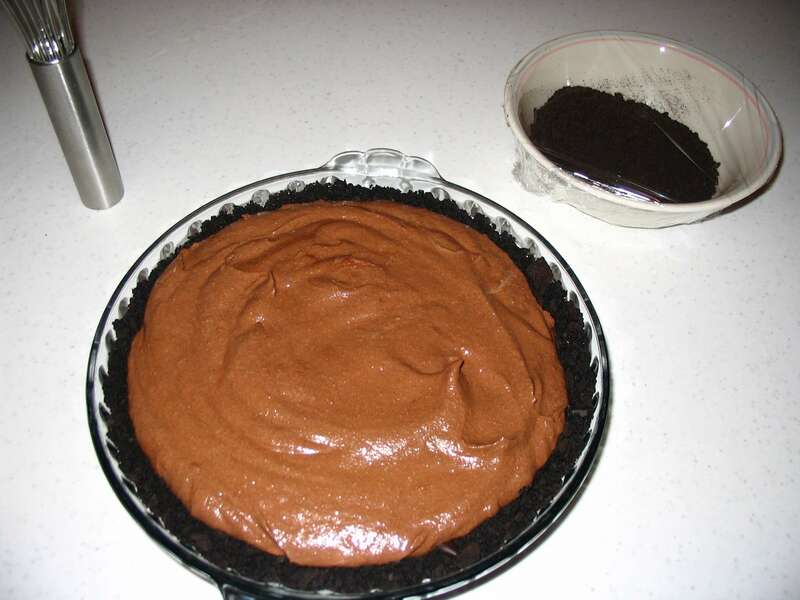 In other words, make an especially fine mousse because of the effect specks and bits will have in this pie. 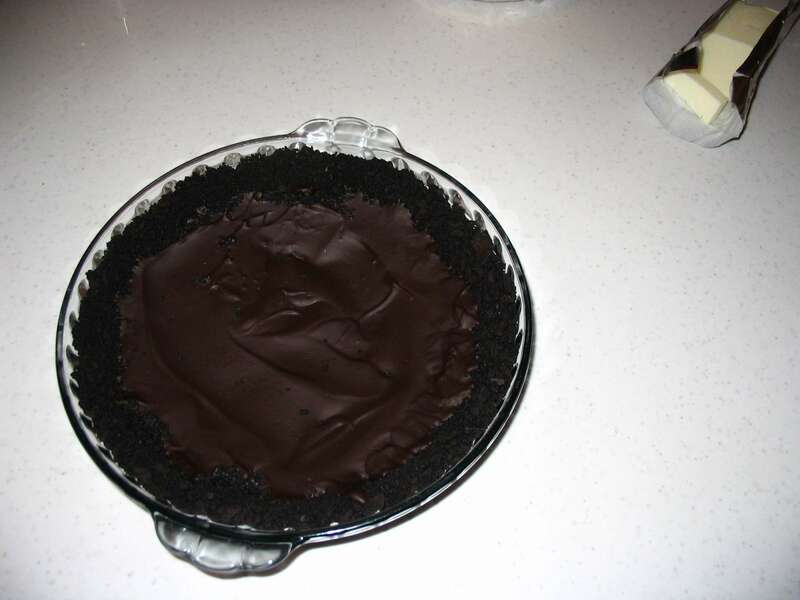 Fill the pie up to even with the top of the plate or tin. Do as much as possible not to push it around for you risk picking up and mixing crumbs into the mousse. 4. Sprinkle the remaining crumbs over the pie. You may have some left over. The only guide is that you do not want them spilling out or seen underneath the chantilly cream topping. 5. Beat two cups of cream with sugar until beginning to reach chantilly stage. 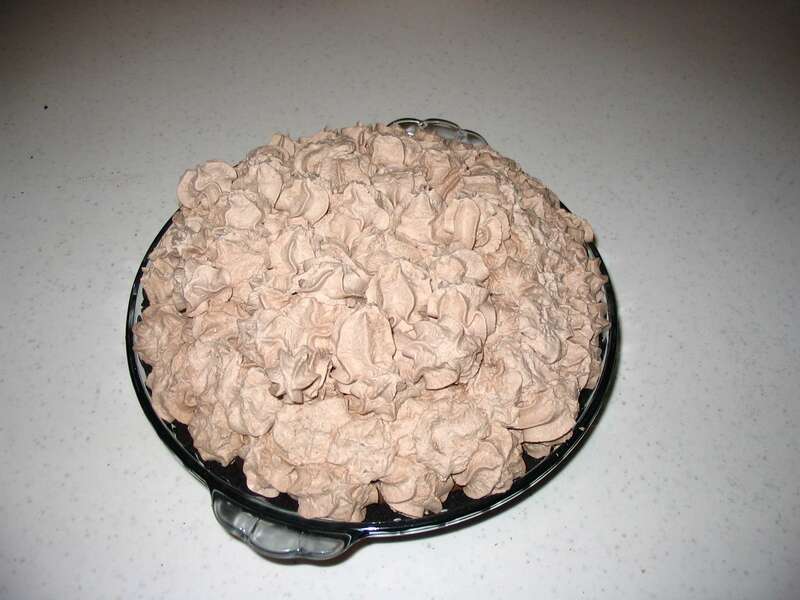 Fold in powdered chocolate and beat until just before butter stage (stiffest chantilly before it turns into butter). Pipe through a very large star tip onto the pie. (See first illustration in recipe.) Store pie between 40° and 50°—not the cold of your refrigerator. Trade off between the refrigerator and the countertop until ready to serve. Moreover, modern, frost-free refrigerators will tend to dry the cream out making it crack. You can put anything else you like in here like those nasty little malt balls, chocolate chips, bits of candy bar, etc. that are all the rage for desserts like these. I like simplicity.